It really shouldn't come as too much of a surprise that Sebastian Vettel qualified on pole at Yeongam for the fourth edition of the Korean Grand Prix. Vettel, who topped the final practice session, now has taken his third consecutive pole of the last three races. Even though it was Lewis Hamilton who set the fastest times during Free Practice 1 and 2, the Mercedes driver was no match for the combined pace of Seb and his Adrian Newey-designed missile. In fact it was Vettel's very first run in Q3 that saw him set pole time. And though it did look for a while like Lewis Hamilton would be able to go quicker still, all that Hamilton was able to manage was to better his own time. This meant that Hamilton lines up second on the grid, his timing of 1min 37.420secs, two-tenths slower than Vettel's 1min 37.202secs. 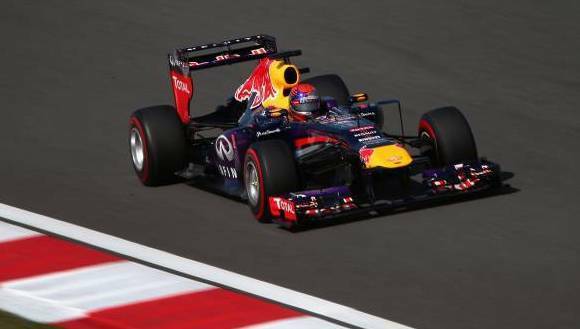 Vettel's Red Bull Racing team-mate Mark Webber set the next fastest time, qualifying third. However, the penalty that he incurred for his third reprimand of the season (following the taxi ride on Fernando Alonso's Ferrari after the Singapore GP) means he will start the race 10 places down in 13th. Fourth on the grid went to Romain Grosjean, the faster of the two Lotus cars, while his team-mate Kimi Raikkonen could do no better than tenth place, a full second behind Grosjean. Scrubbed tyres were being cited as the reason for the Iceman's poor qualifying show. Nico Rosberg put the second Mercedes fifth on the grid. The Ferraris of Fernando Alonso and Felipe Massa slotted in sixth and seventh, while both Saubers had a top-10 finish with Nico Hulkenberg and Esteban Gutierrez taking eighth and ninth spot on the grid. Interestingly enough, even though Sebastian Vettel is the most successful driver at the Korean GP, having won there twice before, no one has ever won the Yeongam race from pole position. Korea could well prove to be the fatal spanner in Vettel's title works. The race tomorrow will tell all.